Rescuers are searching through rubble after the earthquake that killed at least 279 people and injured 1,300. DISTRAUGHT TURKISH FAMILIES mourned outside a mosque or sought to identify loved ones among rows of bodies yesterday as rescue workers scoured debris for survivors after a 7.2-magnitude quake that killed at least 279 people. Rescue teams with generator-powered floodlights worked into the night in the worst-hit city of Ercis, where running water and electricity were cut by the quake that rocked eastern Turkey on Sunday. Unnerved by over 200 aftershocks, many residents slept outside their homes, making campfires to ward off the cold, as aid organisations rushed to erect tents for the homeless. Victims were trapped in mounds of concrete, twisted steel and construction debris after over a hundred buildings in two cities and mud-brick homes in nearby villages pancaked or partially collapsed in Sunday’s earthquake. About 80 multi-storey buildings collapsed in Ercis, a city of 75,000 close to the Iranian border that lies in one of Turkey’s most earthquake-prone zones. “My nephew, his wife and their child, all three dead. May God protect us from this kind of grief,” resident Kursat Lap said. “It’s my grandson’s wife. 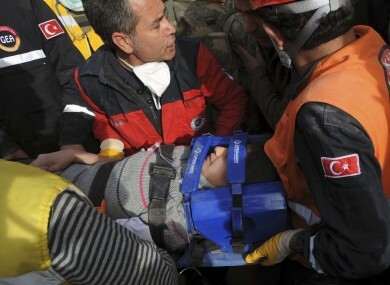 She was stuck underneath rubble,” said Mehmet Emin Umac. Several other men carried a child’s body wrapped in a white cloth as weeping family members followed behind. Still, there were some joyful moments. Yalcin Akay was dug out from a collapsed six-storey building with a leg injury after he called an emergency line on his cell phone and told the operator where he was, Turkey’s Anatolia news agency reported. Three others, including two children, were also rescued from the same building in Ercis 20 hours after the quake struck. Email “Desperate search for survivors as Turkey quake toll nears 300”. Feedback on “Desperate search for survivors as Turkey quake toll nears 300”.